Have you ever created something that you just weren’t quite satisfied with? Like, you came up with an idea you knew was really good, but it just wouldn’t come together the way you imagined it? That’s how I felt with the first Wine Barrel Ring Christmas Wreath. Don’t get me wrong; I don’t think it’s terrible. It just didn’t turn out the way I wanted it to. So you may be asking yourself right now: If you thought it wasn’t up to par, then why did you post it? This year was extremely busy for me to say the least. In March, I doubled up on my graduate courses in order to finish my degree in late September instead of next January. It was great to finish it up earlier than what I initially planned on, but unfortunately I got way behind on our house, yard, the blog, and everything else in the process. Added with the fact that we had committed to hosting Thanksgiving this year, it was a mad rush to get everything caught up and prepare for being this year’s hosts for Turkey Day. When I was finally able to catch a breath, it was December. I should of started working on Christmas projects for the blog on November 1st, but of course that didn’t happen. I was feeling more behind than ever. I decided to at least try to get a few Christmas projects together, but one thing or another would happen to keep me from finishing anything. Something would come up on the day I had planned to work a project. The craft store was out of the supplies I needed. I’d order the supplies online, but then the shipment would get delayed. To top it all off, I had creative block. It wasn’t that I didn’t have any ideas; but when I finally did have the time and supplies I needed to work on them, they just wouldn’t come together the way I envisioned. I was feeling stressed because I wasn’t getting anything posted. So I did the one thing that a blogger should never, ever do: post a project that I wasn’t satisfied with out of desperation so get something up on the blog. I regretted posting it almost immediately. And my other projects still weren’t coming together. I decided the only thing I could do at this point was to take a break and walk away from it for a bit. I was trying to “force” things to come together, but all I was really accomplishing was spinning my wheels. After taking a couple of days off from trying to get anything done on the blog, I was able to regroup, get my creative juices flowing, and redo this wreath project in a way that made me happy as well as get some other projects going in the right direction too. It was then I remembered that creativity isn’t something that can be forced; it’s there when it’s there, and when it’s not there, the only thing I can do is walk away for a bit until it returns. I also remembered that simple projects are almost always the best. I was trying to make the other wreath too fancy to increase the “wow” factor, but in the process I lost sight of what I really like: simple, down to earth projects that don’t have to be complex to look great. So, if you ever thought that DIY bloggers always have a ton of creative ideas that always come together without a hitch, please allow me to be the first to tell you that isn’t the case. We’re just like everyone else who loves doing DIY projects; the only real difference is that we’re nutso brave enough share the results with the world. Okay, enough of all that! Let’s get to the project! 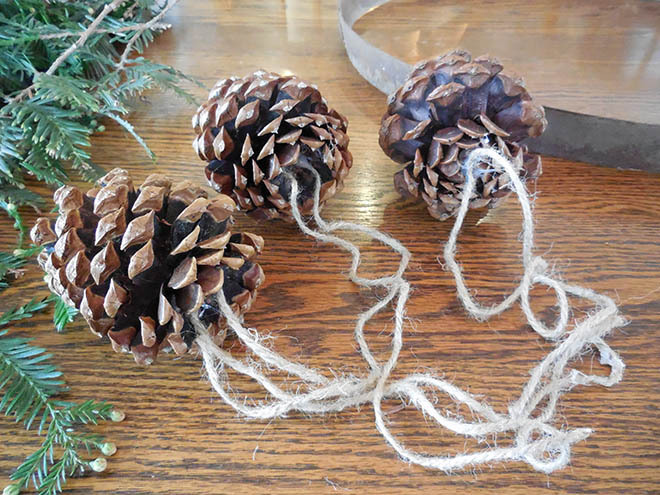 Cut jute twine into 1 foot strands and glue them on the back of the pine cones as pictured below. 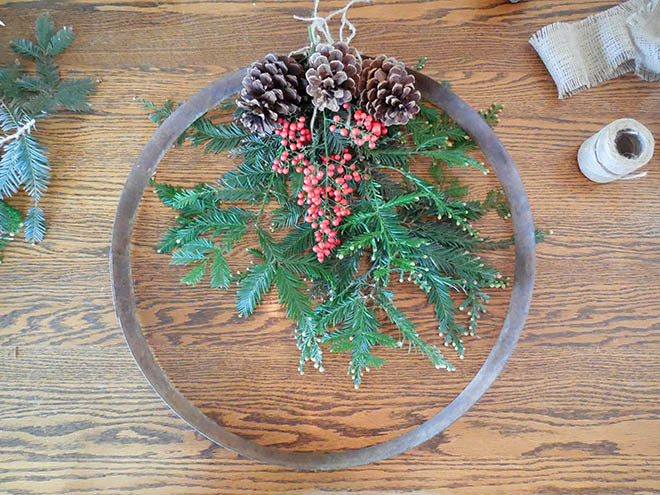 Arrange and tie the greenery at the stems and tie at the top of the wine barrel ring. Slip the red berry stem into the tied greenery twine and secure with a bit of hot glue if necessary. Tie on the pine cones at the top of the wine barrel ring over the greenery and berries; then tie them together to prevent them from slipping down the sides of the ring. 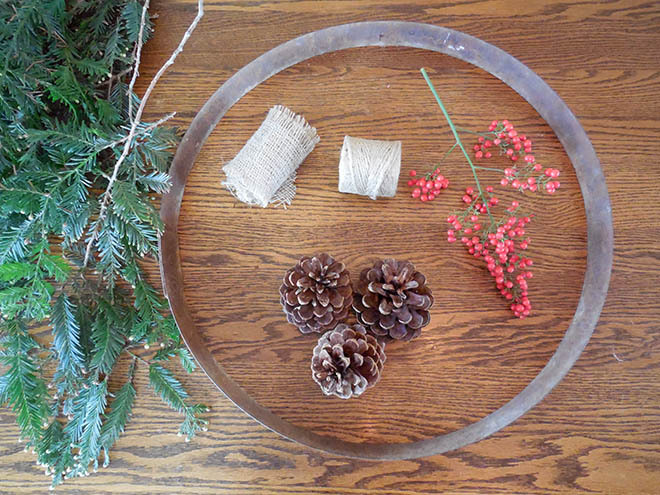 Make a bow out of the burlap ribbon and tie or glue it on the top of the wine barrel ring. 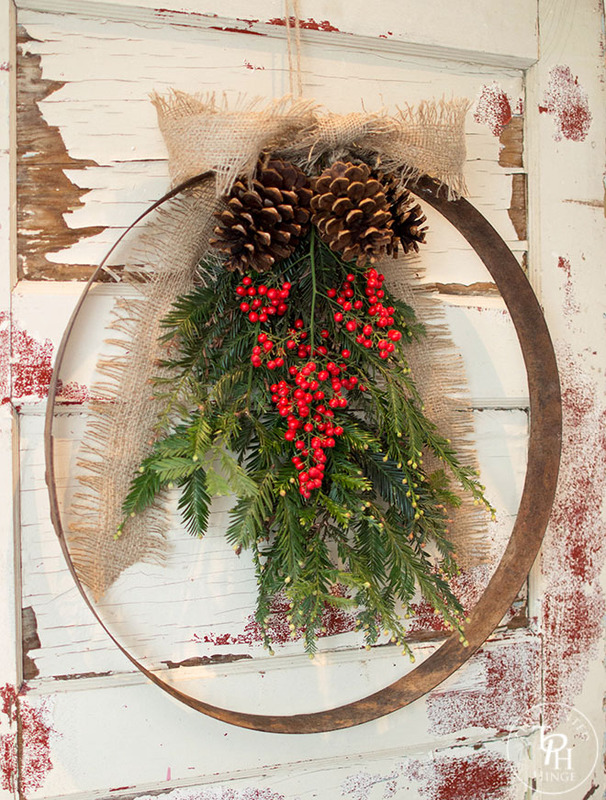 Thread a strand of jute twine through the top of the ring and tie a loop to hang the wreath. As you’ve probably figured out already, this wreath probably wouldn’t be the greatest on a door that is being used as it would bang against and scratch it. This is best suited on a “decor only” door like I used it or on a wall. 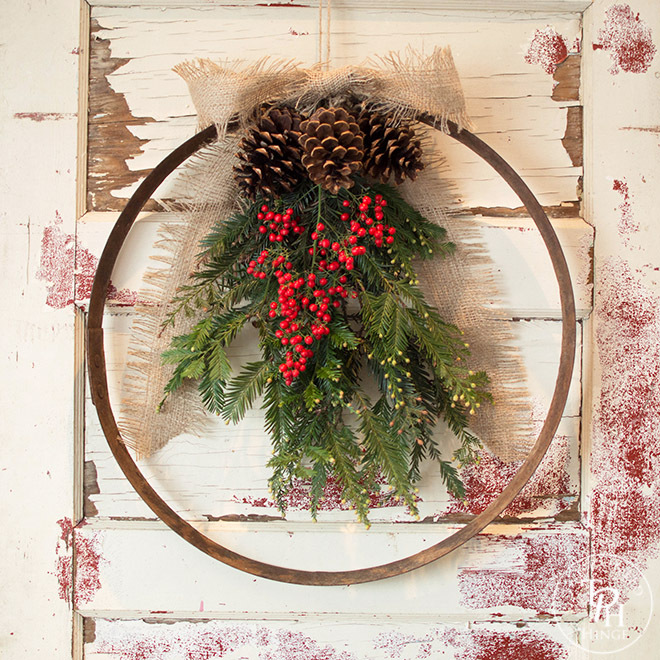 I hope you enjoyed this (redo) tutorial on how to make a wine barrel ring Christmas wreath! If you have any questions or comments, please leave them in the comments section below! I really like this project, it’s simple and elegant. Looks like you used pepper berries, they can be difficult to make look right when left on the stem, but goodness they’re beautiful and my favorite berries. 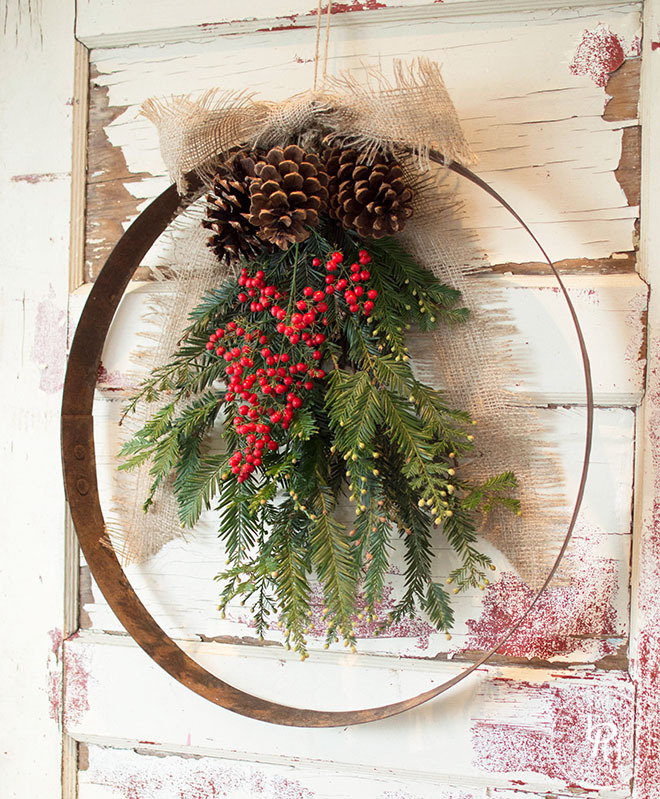 Lovely wreath idea and I just happen to have some rusty rings outside. Thanks so much Carole! 🙂 Merry Christmas! Thanks so much Jamie! 🙂 Merry Christmas! Michelle, as I was finishing up my party visits this week, I returned to your fabulous wreath. On my first visit, I was so enamored by your pretty photos, I overlooked your poignant post. First of all, from the wonderful content you shared this week, I would have NEVER known you’d had a creative block! I’ve been sharing them on my social media to spread a little love 😉 Also, I think many bloggers can relate to the feelings you described, including your first wreath–I know I can. Thank you for your transparency, I always appreciate it and also for sharing @Vintage Charm! p.s. I thought your first wreath was lovely too, but I do love the second version best! Cecilia, thank you so much for sharing your thoughts on this – I’m happy to hear that this post resonated with you! 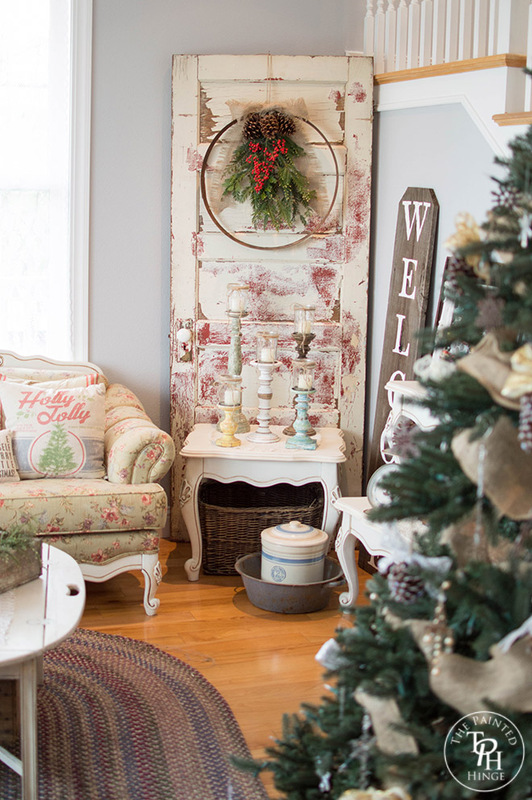 I do try to “keep it real” as much as I can to break the illusion that all DIY bloggers always have perfectly decorated houses and projects that always go off without a hitch. A DIY or decor project that ends up on any DIY blog is almost always the result of hours and hours of planning, creating, cleaning, decorating, and most of all trial and error. Bloggers make it look easy becasue we usually only share the end result, so I think it’s imprortant for people (bloggers and non-bloggers alike) to know that no one is perfect and we all struggle from time to time. I’m a little confused. Is the wreath you show the tutorial for the same one as the one shown at the beginning of the blog? The one you didn’t like? Because they look exactly alike to me. I really like the idea and how it turned out. I have some metal rings from a barrel that came apart. I was thinking I could do something similar with those rings, even though they are smaller than the one you used. The idea is very creative and the end result pretty great-looking! Loving this idea, I have a broken ring from a wine barrel planter that now I know what I can do with. Hi there, tthis weekend iss good in support of me, for the reason that this occasion i am readin thius impressive infordmative piece of writing here at my home. I loved as muh as you will receive cartied out right here.